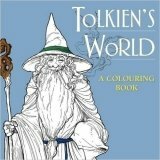 This mystical colouring book presents an abundance of famous scenes and characters inspired by Tolkien's Middle-earth. From Gandalf the Grey to the humble Hobbits, take time off from the busy pace of life and indulge your imagination while exploring the enthralling world of The Lord of the Rings and other tales. There's something new on every page as you discover the intricate elvish designs, fearsome characters and breath-taking landscapes - perfect to satisfy Tolkien fans and beyond.